Framsden is a quiet little village, not far from the great bulk of Helmingham Hall; in fact, Helmingham village school is between the two villages. The houses cluster along the single street, among them a corrugated iron village hall and the Doberman pub. The church is close by, and you cross a little bridge from the north, through one of Suffolk's best lych-gates, the gates lettered in Gothic script Enter into his Gates with Thanksgiving. The church sits on rising ground, the tower similar to that of Helmingham. The south porch was restored by Munro Cautley in the 1940s, one of his last jobs for the Diocese. The nave and south aisle are mainly 14th century, although the hammerbeam roof is later. The font is rather battered, and in the south aisle there is a rustic 17th Century memorial to William Stebbing, but otherwise the nave and aisle are rather plain and empty, as if not used often - which they probably aren't, as the chancel is separated from the nave by a curtain. You step through this into to the chancel. This is also 14th century, although extensively restored in the 19th century. Mortlock found a Saxon carving of a face in the window surround, suggesting an earlier church on the site. The current building was probably the gift of the Tollemaches who still live, as they did then, at Helmingham Hall. The chancel is homely and pleasant, as if it is the real heart of the building. And in the sanctuary there is an ancient wonder. The seats to the north of the altar cannot be in their original place in the church, and may not even be from this church at all of course, but if you lift the seats up, and you will find some of Suffolk's best misericord carvings, albeit in a county not abundant in them. There are five, and perhaps the best shows a saint donating a church with a pelican on either side. Another shows part of an Annunciation scene. They have been mutilated, probably at the time of the Reformation - it looks as though someone came with an axe and took a swipe at each one. St Mary is as unsuitable for the day-to-day life of its parish as any large medieval building. The decision to use only part of it is at once realistic and discouraging, but I was pleased to find, coming back after twelve years, that the nave seemed in better care and condition now than it had then. I remembered my conversation with the churchwarden back in 1999. She was interested to know what I thought of the misericords. She was as angry about the mutilation as if it had happened yesterday, illustrating graphically how it had happened with the mime of a swipe. I told her I had just come from Helmingham church, home of the outrageous Tollemache tombs. "That's not a church", she growled. "It's a mausoleum". 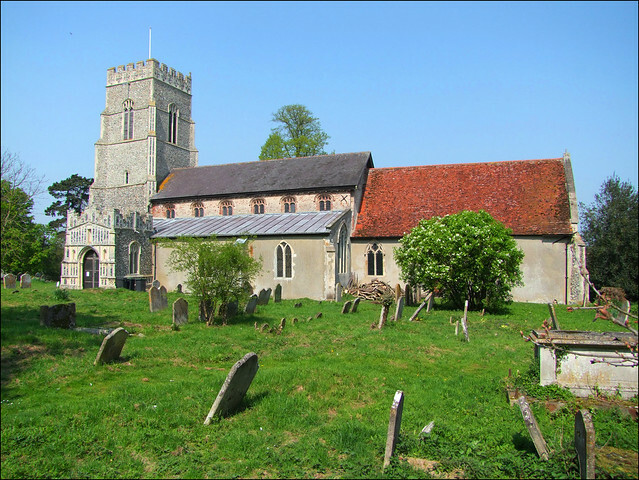 How lovely, that in the last years of the twentieth century, two neighbouring Suffolk villages could still indulge in rivalry about their churches.